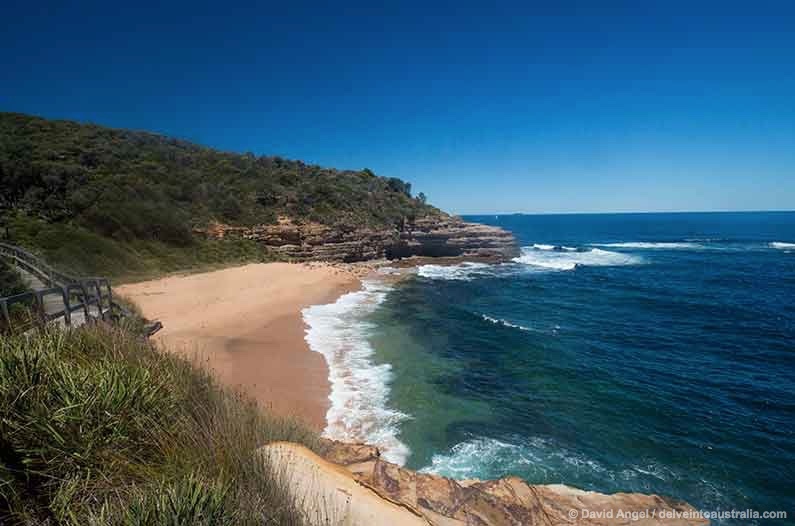 1 The Bouddi Coastal Walk is the outstanding feature of the Bouddi National Park, a stunning wilderness at the southern end of the Central Coast, just across the water from Barrenjoey Head and Sydney’s Northern Beaches. 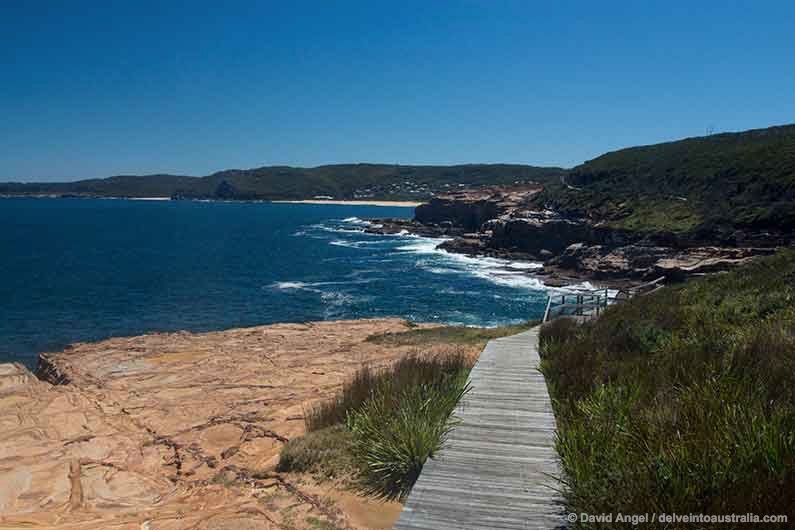 The Bouddi Coastal Walk is the outstanding feature of the Bouddi National Park, a stunning wilderness at the southern end of the Central Coast, just across the water from Barrenjoey Head and Sydney’s Northern Beaches. It is thanks to Marie Byles, a conservationist (and also NSW’s first female solicitor) that this amazing landscape has been preserved and protected from the encroachment of suburbia. 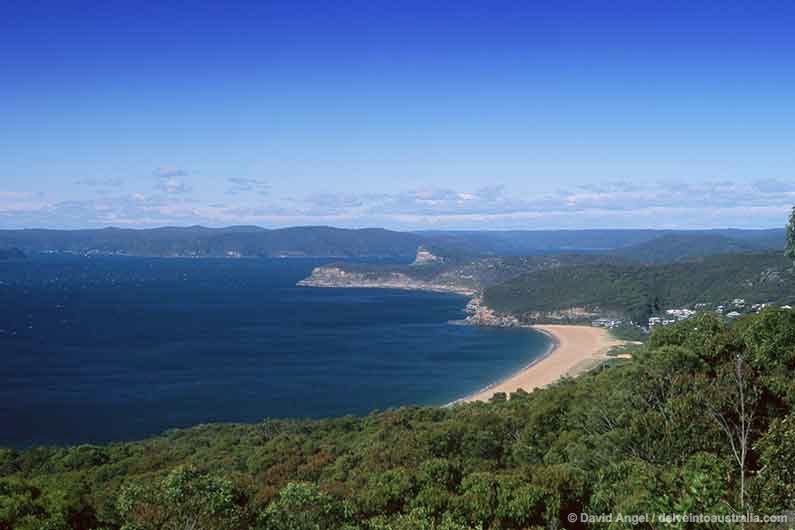 The Lookout named after her on The Scenic Road, overlooking Putty Beach, Broken Bay, Barrenjoey, Pittwater and her home area in the far north of Sydney is a fitting tribute to her work, and a great starting point for exploration of the Park. 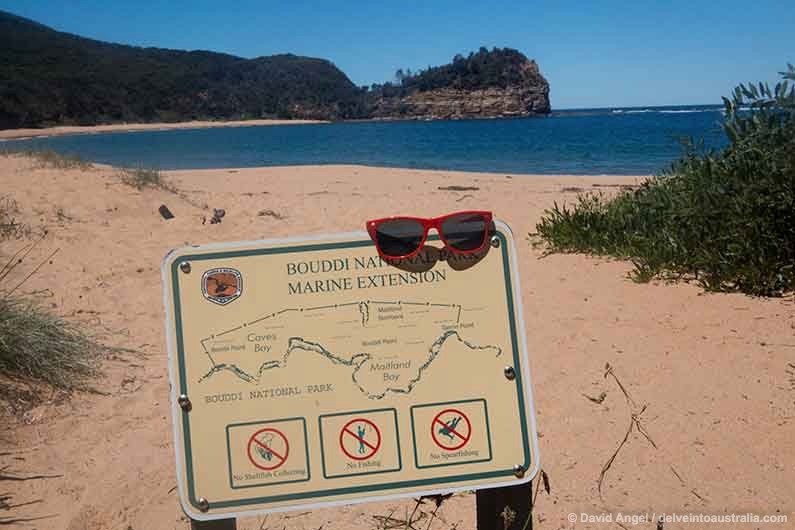 The Bouddi Coastal Walk runs 8 km from the east end of Putty Beach to MacMasters Beach, but it feels considerably longer. And that’s a good thing. This is a coast walk for connoisseurs, with some of the finest scenery you’ll find anywhere along the Tasman Sea, with pristine beaches almost to yourself, plenty of steep climbs and descents, and puddles lingering a week after the last rain. 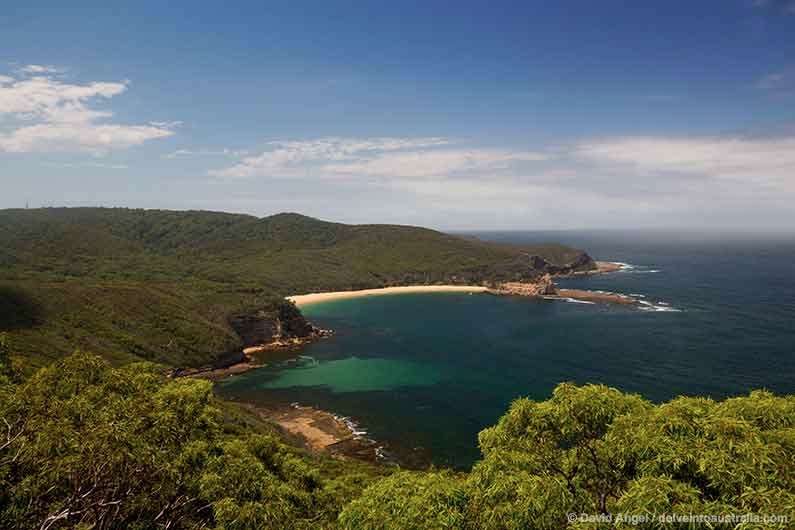 It’s one of the best day hikes near Sydney, along with some in the Blue Mountains and the Royal National Park. It’s also one of the best Central Coast bush walks, and well worth a day of your time, even if it’s your first trip to Australia. It is that good. 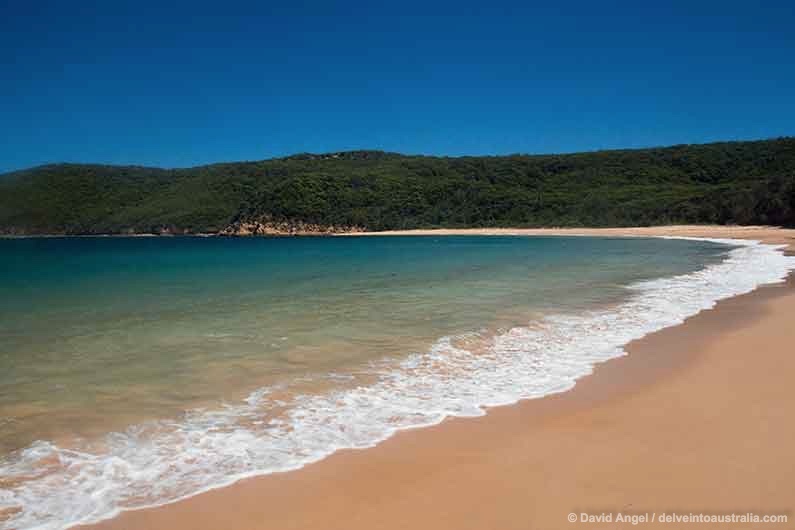 As we had to double back, we opted to start and finish at Putty Beach, which is at the east end of Killcare NSW beach. After passing a tiny lagoon we walked the last 200 metres of the beach before climbing a series of wooden stairs which take you out onto coastal heathland. 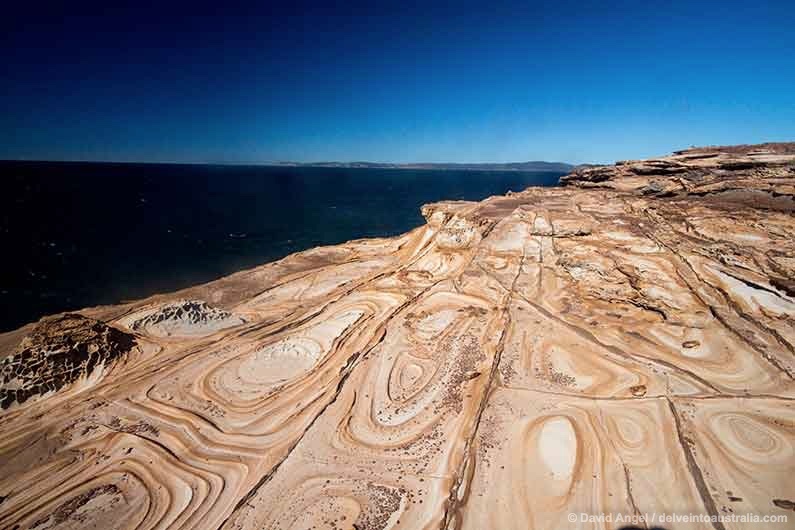 Soon afterwards we reach an incredible array of rock formations carved by Nature over millions of years. These range from the square checkerboard tessellated pavement adjacent to the path to the liesegang rings, concentric circular and oval patterns etched into the rocks. 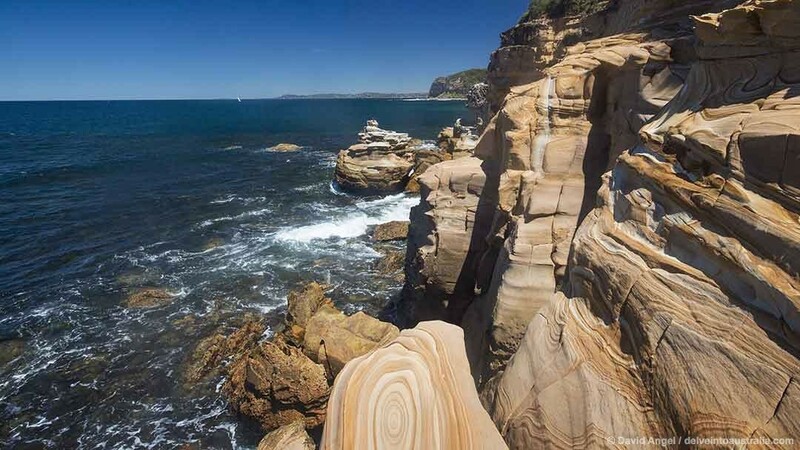 These provided the foreground to views across to the other section of the National Park and Box Head, and across Broken Bay to Pittwater and the Northern Beaches. And then there was Bullimah Beach, a perfect little curve of sand to which we would have to return. From here it’s a short, steady ascent to the Gerrin Point Lookout, which gives the first distant sighting of Maitland Bay, the destination of choice for many visitors to Bouddi. A perfect crescent of sand some distance along the undulating track through the bush. We get further tantalising glimpses of the beach through trees on our right, and we are eventually joined by walkers taking the short downhill route from the Maitland Bay Centre, reaching our first goal a few minutes later. 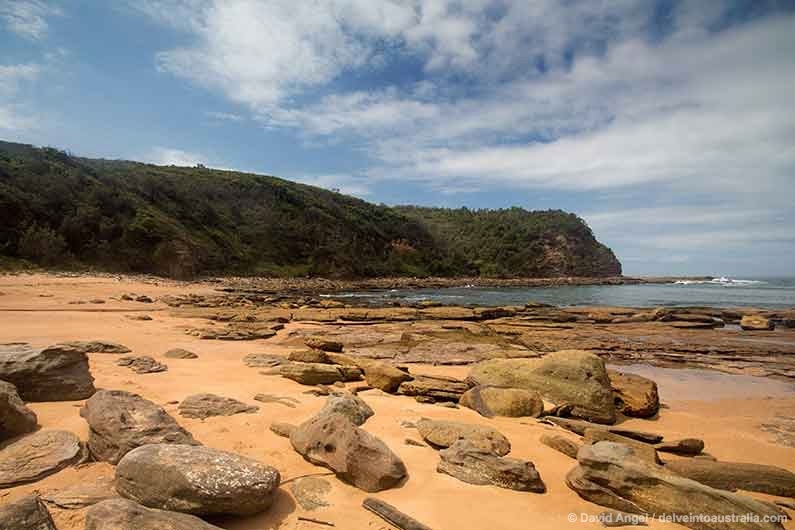 The crowds – alright, about 15 people – had started to thin out after the rock formations next to Bullimah Beach, and now six of us had Maitland Bay to ourselves. This was on a late summer day, 26°, with a cooling breeze, near perfect hiking weather. We decided to stop to savour this corner of paradise, and found two rocks perfect for doubling as recliners to lie back, cool down in the shade of a tree, and listen to the sound of the waves rhythmically splashing onto the beach and washing back. 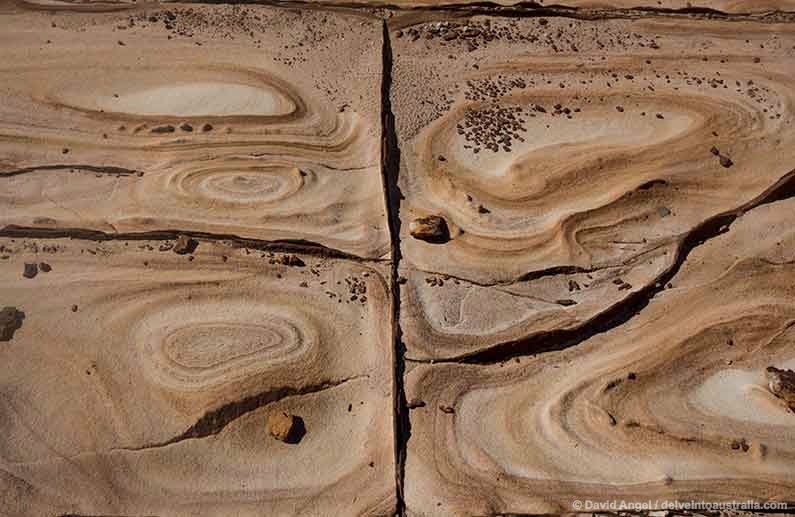 Before leaving the beach behind, I went back across to look at the rock patterns at the end of the beach, which at first glance were as striking as those near the beginning of the walk. I climbed to the top of the rocks to peer around the corner across Broken Bay, to find an almost perfect set-piece photograph, with a liesegang-ringed rock in the foreground, a line of cliffs, a cormorant perched imperiously on an outcrop of rock, and a white sailing boat leaving the next cove with Sydney’s Northern Beaches in the distance. You just couldn’t make it up. We could have happily stayed all afternoon, but we still weren’t even halfway through the outward leg of our hike. 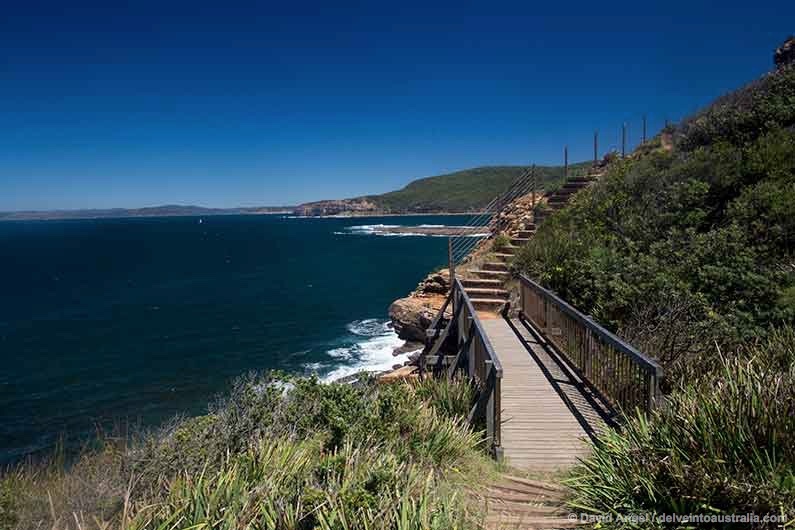 Instead, we climbed the steps at the end of the beach, gradually leaving Maitland Bay behind and reaching another high point along the top of a ridge, passing the first of several side trips, the uphill trail to Mount Bouddi Lookout, which we left for another day. We weren’t on level ground for long, as the view opened out and the path descended to the windswept rock platforms of Caves Bay. Whereas the sea back at Maitland Bay – not much more than 1 km away – was like a millpond, here it was in a foaming white rage, crashing onto the rocks. The wooden footbridge at the bottom gave us a close view of the drama below. Still the track made us work for our rewards, next two steep ascents and descents, the first a series of muddy pools, one above the other, that we would have to take our three-year-old back to one day for some serious splashing. Eventually we plateau at Bombi Moor, a series of elevated dunes high above the ocean. We then made our way down from the heathland, through the rainforest to meet up with the fire management trail linking the car park at the end of Grahame Drive with Little Beach, 300 metres down the hill on our right. Immediately we knew we would have to bring Little Man back here. There is a tiny campsite with six pitches, next to a creek only metres form the beach. The beach, not much more than 100 metres across, is a little paradise, a narrow, sheltered strip of sand at the end of a deep cove, with rainforest leaning right over the crumpled cliffs below to the edge of the ocean. Either side there are hundreds of flat rocks perfect for playing stepping stones, guarding lots of rock pools to explore. Back up the hill, we turned right across the wooden bridge over the creek to continue our trek, soon pulling up the hill for one last climb to join the Mourawaring Moors Fire Trail. From here it was only a short walk to Beachview Esplanade and suburbia, continuing down to MacMasters Beach Surf Club, and the end of the Coastal Walk. We had it all to do again, this time predominantly facing the afternoon sun. Now that it was familiar terrain, it all seemed quicker than our outward journey. Except for Maitland Bay, where we took advantage of the favourable low tidal conditions to take a look at the remains of the wreck of the SS Maitland, after which the Bay was named. We also returned to the rocky viewpoint at the other end of the beach, to find the same cormorant on the same rock letting the light wind ruffle its wings, still surveying the scene. A fine way to spend the afternoon, we agreed. If you’re driving from Sydney, the quickest way is to take the M1 northwards, turning off near Gosford to take the A49 Central Coast Highway. Shortly after leaving Gosford, turn right onto Avoca Drive, continuing as far as Kincumber, where you take another right onto Empire Bay Drive. Continue along Empire Bay Drive, passing through the suburb of Bensville before taking a left onto Wards Hill Road, which climbs a steep hill before joining The Scenic Road. Turn right at the junction, staying on The Scenic Road before taking the second left turn onto Putty Beach Drive. The car park and start of the walk are at the end of the road. There is an $8 fee (correct coins or card) payable at machines at the car park at the end of Putty Beach Drive which covers entry to the National Park.